This week’s spelling words list focuses on sight words, words with suffix -able, and academic vocabulary. The spelling words that you will find in week 3 include: constant, Africa, killed, melody, bottom, Florida, secret, tumble, afterwards, cathedral, desirable, excitable, breakable, notable, tolerable, questionable, hundredth, thousandth, tenth, and millionth. 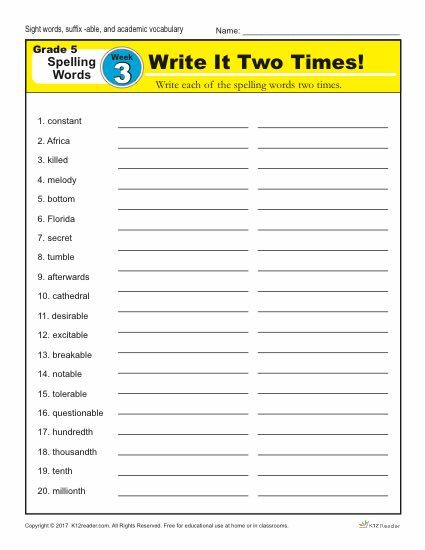 Students will complete five printable worksheets: Write it Two Times, Dictation Sentences, Circle the Correct Spelling, Write a Sentence: Part 1 and Write a Sentence: Part 2. This is a great way for students to practice their writing skills as they will be asked to write their own sentences using each spelling word. For the full 36 week spelling words master list, click here.